Rabbi Menachem leads Tiferes Yisroel. Rabbi Goldberger is known for his inspiring niggunim which are sung around the world and in all different streams of Judaism. 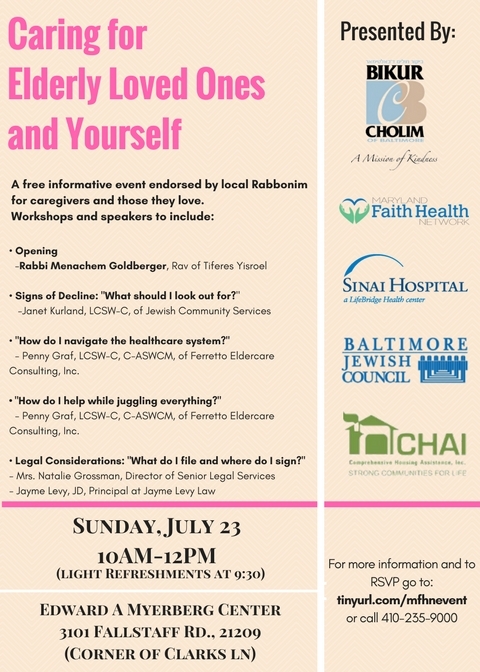 Janet Kurland, LCSW-C, C-ASWCM, is a Senior Care Specialist at Jewish Community Services of Baltimore. During the past 30 years she has worked in Gerontology, founding a major multi-purpose senior center, pioneering the development of community based social work services to the elderly and serving as a consultant to nursing homes. She has distinguished herself and received many awards and citations, including several from the Governor’s Office of Maryland noting her contributions to the state’s elderly services. She is President Emeritus of the Maryland Gerontological Association. She is the first recipient of the Daniel Thurz Distinguished Service Award from the Kehilla, Jewish Communal Professional Association of Greater Baltimore. She has also been honored as a founding director of the Myerberg Senior Center. Penny Graf, LCSW-C, C-ASWCM, is an Aging Life Care™ Manager with Ferretto Eldercare Consulting, Inc., with more than 12 years of professional, clinical experience working with clients, caregivers and families, especially related to aging and healthcare issues, adjustment to serious illness, palliative care and end-of-life concerns, community resources, and client and caregiver counseling and support. She holds a Master of Social Work (MSW) degree from the University of MD and a Master of Arts (M.A.) degree from the University of Baltimore. She is a licensed, clinical social worker and is also certified as an Advanced Social Work Case Manager (C-ASWCM) through the National Association of Social Workers (NASW). She serves as a Social Work Supervisor for the MD Board of Social Work. She has been a family caregiver for more than 25 years. Director Natalie L. Grossman has been with Senior Legal Services since February 2013. Ms. Grossman came to Senior Legal Services after 4.5 years at a mid-sized Baltimore County firm. She graduated from Virginia Tech and the University of Baltimore School of Law. She is in charge of the program’s day-to-day operations. She regularly meets with clients at our office in Courthouse East, and at senior centers and senior citizen apartment buildings all over Baltimore. She also maintains and works to increase the program’s funding, builds and maintains relationships with other pro bono legal service providers, serves on various task forces and work groups, supervises program staff and interns, and serves as a liaison between the program and our oversight Committee, as well as with the Bar Association of Baltimore City leadership. Ms. Grossman resides in Baltimore City with her husband and their children. Jayme Levy is the principal attorney at the Law Offices of Jayme L. Levy, LLC. A native of Baltimore, Ms. Levy attended Ohio University for her undergraduate studies where she attained her B.A.s in political science and history. While at Ohio University, Ms. Levy was a four (4) year member of their Division I Women’s Lacrosse team. After college, Ms. Levy returned home to attend law school at the University of Baltimore. Upon graduation, Ms. Levy served as the Honorable Robert E. Cahill, Jr.’s, judicial law clerk in the Circuit Court for Baltimore County and has worked at law firms in the Baltimore area. Ms. Levy primarily focuses her practice on the areas of elder care, estate planning, and special needs planning. In addition, Ms. Levy helps veterans and their spouses apply for Veterans Benefits.